Sheet Pan Balsamic Chicken with potatoes and mushrooms makes a great quick and easy weeknight dinner. The entire family will love this easy one pan meal! We love sheet pan dinners because they are quick to put together and everything goes on one pan. 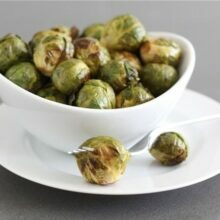 They are perfect for busy weeknight dinners or easy entertaining. You put everything on one pan, put it in the oven, and when you pull out the pan, dinner is DONE and ready to be served. You can’t beat that! 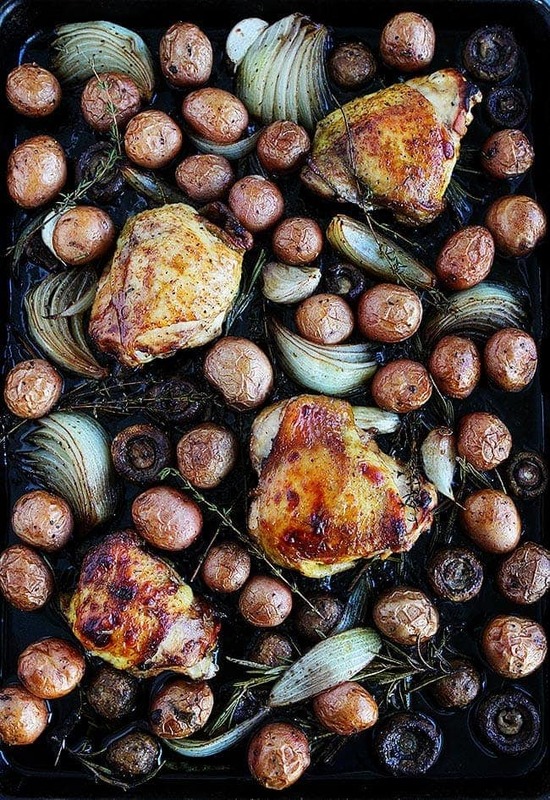 Our new favorite sheet pan dinner is this Sheet Pan Balsamic Chicken with potatoes and mushrooms from Dorie Greenspan’s new cookbook Everyday Dorie, which is filled with easy weeknight meals. 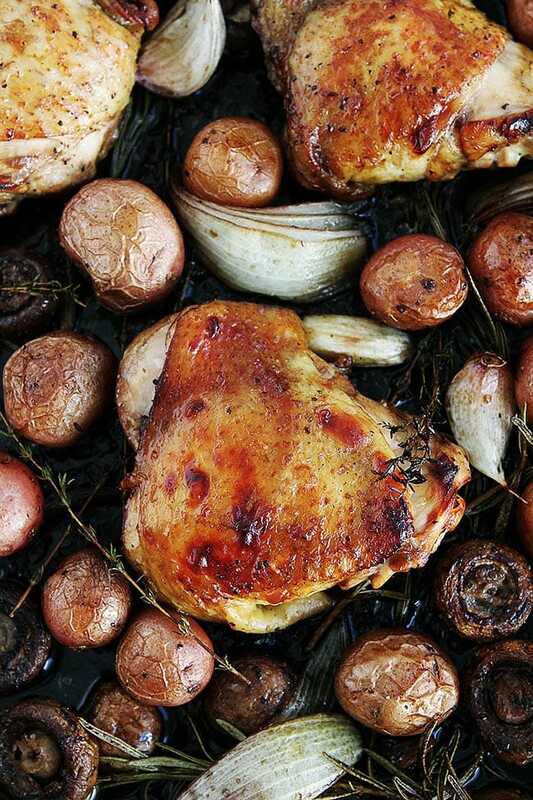 You are going to love the book and this sheet pan chicken dinner. For this recipe, you can use whole skin-on chicken legs or bone-in chicken thighs with the skin. The cook time is a little longer for this recipe because the potatoes need time to get nice and crispy. Bone-in chicken legs and chicken thighs with the skin won’t dry out. You can use chicken breasts, but we suggest using bone-in chicken breasts. The flavorings are simple for this chicken recipe: oil, balsamic vinegar, and fresh herbs. 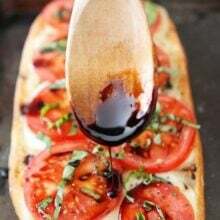 Use a high quality balsamic vinegar for best results, but any balsamic will do. The balsamic vinegar gives the chicken and vegetables a ton of flavor. It is amazing what one ingredient can add to a recipe! Preheat the oven to 450 degrees F. Grease a half sheet pan with a little olive oil or for easy clean up line the pan with aluminum foil and oil. Use small potatoes for this recipe. If you have larger potatoes, you can cut them in half. Make sure all of the potatoes are the same size so they will cook evenly. You can use a shallot or onion, we used an onion. Cut the onion into wedges. 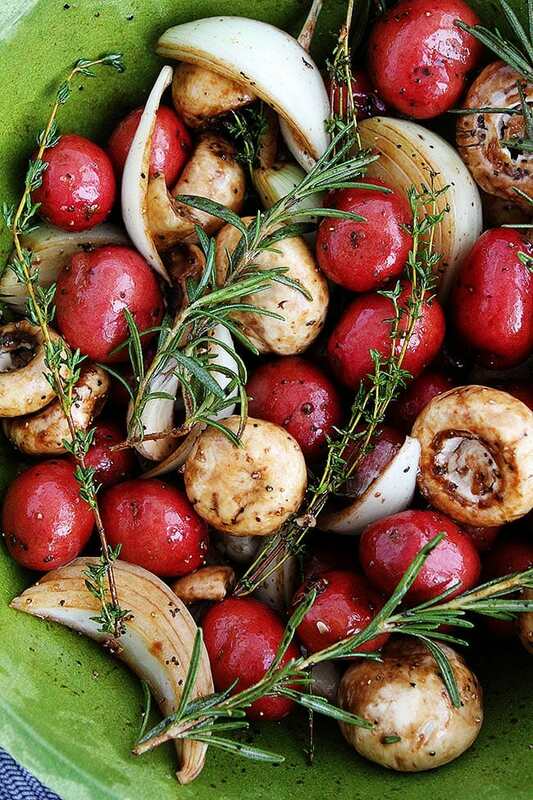 Place the potatoes, mushrooms, shallot or onion, and garlic in a large bowl. Add the rosemary, thyme, salt, peper, and toss with olive oil and balsamic vinegar. Make sure the vegetables are well coated. Spread on the prepared baking sheet. Next, put the chicken in the bowl and toss with oil and balsamic vinegar. Season with salt and pepper. Move the vegetables around on the pan to make room for the chicken. Tuck the remaining herbs under each piece. Roast the chicken for 40 minutes to an hour, or until a thermometer stuck into the thickest part of the meat reaches 165 degrees F.
Remove the pan from the oven and serve everything on a large platter, spooning the juices over the top. The chicken is best right out of the oven, but leftovers will keep in the fridge for a couple of days. You are going to love this balsamic chicken recipe. 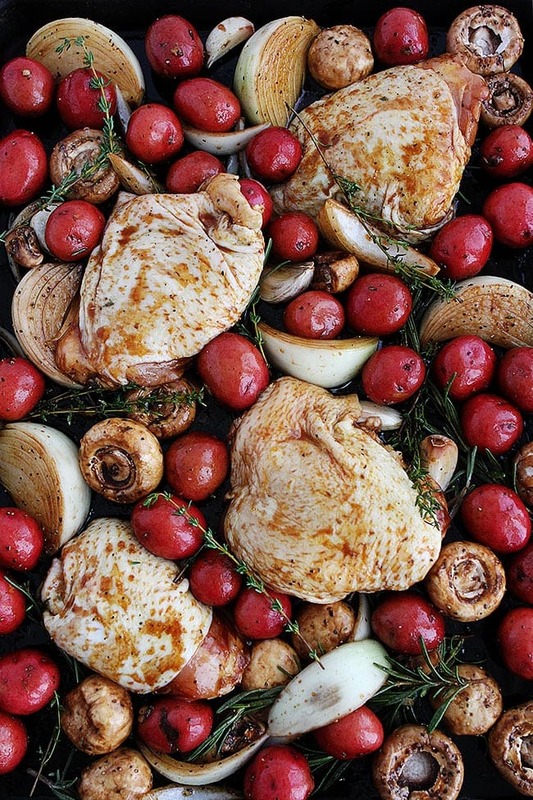 The balsamic caramelizes the chicken, potatoes, and mushrooms while roasting in the oven. The onion, garlic, and rosemary, and thyme add classic and comforting flavors to complete the meal. And the best part? Everything gets cooked on ONE pan! This is a weeknight dinner lifesaver! 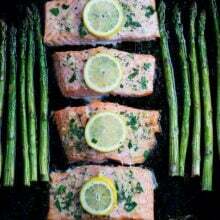 It is also a great meal for easy entertaining. If you are having more people over, just make two pans! This recipe is easy to double. 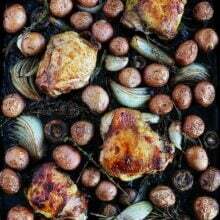 Add this sheet pan balsamic chicken to your dinner rotation and make sure you check out Dorie’s new cookbook! It is a new favorite at our house! Center a rack in the oven and preheat it to 450 degrees F. Rub a baking sheet with a little oil (or line it with foil and oil the foil). Put the chicken in the bowl, along with remaining 3 tablespoons of balsamic. Mix everything well and spread the ingredients out on the baking sheet. Put the chicken in the bowl, along with remaining 3 tablespoons oil and 2 tablespoons balsamic, 1/2 teaspoon salt and a good amount of pepper, and mix well to coat the chicken. Move the vegetables around to make room for the chicken. Tuck the remaining herbs under one piece. Roast the chicken for 40 minutes to 1 hour, until a thermometer stuck into the thickest part of a thigh measures 165 degrees F.
Recipe from Everyday Dorie by Dorie Greenspan. If you prefer chicken breasts, use bone-in chicken breasts for best results. Leftovers are good for a couple of days; cover and refrigerate. Is the recipe supposed to read 8 Tbsp of Balsamic Vinegar? I just want to clarify before I make this! Looks delicious. You need 5 tablespoons balsamic vinegar total, it is divided. 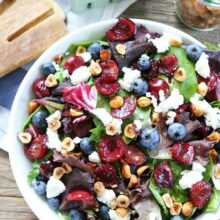 Balsamic is one of my all time favorite things, so I am making this as soon as possible. But I just wonder what makes the fat content so high? Roasted chicken doesn’t seem like it would be so high. You state 4 tablespoons balsamic vinegar in Ingreients. Then you state a total of 8 tablespoons balsamic vinegar in the directions. What is the amount? Updated the recipe, sorry for the typo! going to try this one tonight. your photography of the food is very, very good. my wife is a photographer and she was impressed.